Back when I taught high school, I spent one week in the summer on the campus of Stephen F. Austin University in Nacogdoches, Texas as sponsor at the Texas Association of Student Councils Officer Leadership Camp. Being around several hundred teenagers for a week was a lot of fun, but I learned a lot more about the small town in East Texas at the same time. Evidence of settlement dates back thousands of years and is situated on the or near the site of the primary village of the Nacogdoches tribe of the Caddo Indians. They were travelers and traders and built log cabins between the Banita and Lanana Creeks in the area.The village remained an Indian settlement until the early 19th century. Spain had established a mission there in 1716, but after the French were no longer a threat to the area, maintaining the mission became too costly and in 1772, all settlers in the area were forced to move to San Antonio. However, many were reluctant to leave and longed to return. Colonel Antonio Gil Y’Barbo, a prominent Spanish trade, became a leader of the group and led them back to Nacogdoches in the spring of 1799. In the summer of 1779, Spain bestowed the designation of it being a pueblo or town. Thus it became the first “town” in Texas. The origin of its name comes from two sons born to a Caddo Indian chief of a tribe living on the banks of the Sabine River. The two sons were Nacogdoches who was fair with yellow hair and blue eyes and Natchitoches who was swarthy with black hair and black eyes. The story goes that the old chief called his sons into presence as he lay dying in order to give them his final blessings. He commanded Natchitoches to gather his wife and children and turn his face to the rising sun. 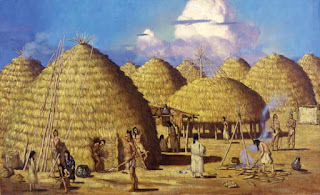 He was to travel for three days then build his home and start a tribe. Nacogdoches was told to turn his face to the setting sun, walk three days with his family then stop and build his home and tribe. So the two towns were born 150 miles apart, one in Texas, the other in Louisiana. As intriguing as the story is, most historians say it isn’t true. The Louisiana version even has the sons being banished instead of receiving a blessing. However, the story is so ingrained in the history of the town that very few will dispute the legend. This is an artist's rendition of a typical Caddo Village. Y’Barbo laid out streets with El Camino Real and La Calle del Norte as the central point. 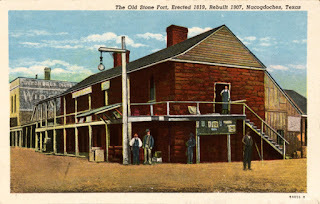 The first house, or Old Stone Fort as it is called today, became a “gateway” from the upper states to the frontier much like St. Louis became a gateway to the West. 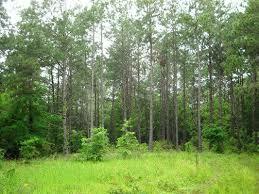 The earliest settlers were the Caddo Indians called the Nacogdoches Tribe. They were travelers and traders who later replaced the grass and straw huts with log cabins between the Banita and Lanana Creeks in the area. While Texas grew under six flags, Nacogdoches had more than that. It also flew the flags of the Magee-Gutierrez Republic, the Long Republic, and the Fredonian Rebellion. Nacogdoches was the scene of the first clash between Mexican and Texans on August 2, 1832 with the Battle of Nacogdoches. Adolphus Sterne led a group of Texas revolutionaries who forced the Mexican garrison out of Nacogdoches and freed East Texas from military rule. Like the rest of the South, Nacogdoches suffered losses during the Civil War and Reconstruction years, but by 1880, it became a town booming with success and grew even more as the Houston East and West Texas Railroad came to the town in 1882. At that time the economy switched from agriculture to trade and commerce. As a matter of record, the first oil well in Texas was there in 1859, but it was never as well known as Spindletop drilled in Beaumont, Texas in 1901 nor did it produce like Spindletop. The arrival of the Houston, East and West Texas Railway in 1882 changed the economic outlook for the area in dramatic fashion. With the coming of the railroad, Nacogdoches once again emerged as an important trading center. However, the railroad also brought to an end the riverboat traffic on the Angelina and the decline of towns like Pattonia that had depended on the boats. The railroad also changed the face of the county in other ways with a host of new towns along the lines. 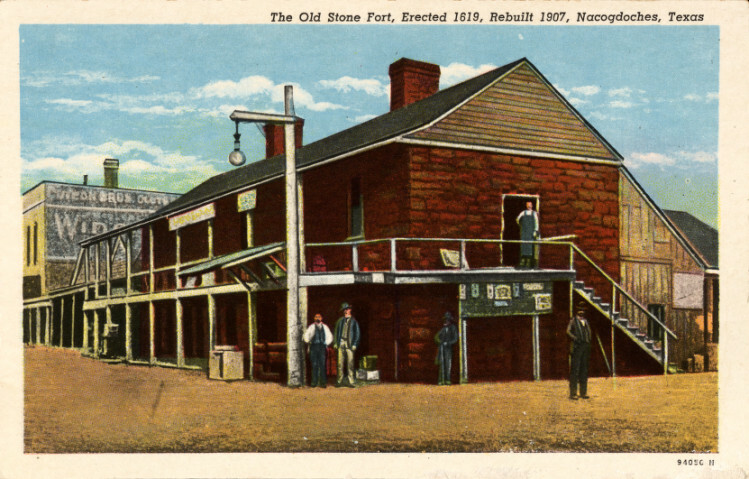 As Nacogdoches was situated in the heart of the Piney Woods of East Texas, the construction of the railroads also spurred the development of the lumber industry which emerged at the end of the nineteenth century as one of Nacogdoches County's most important industries. Among dignitaries who made Nacogdoches home for a few years or longer were Sam Houston and Thomas Jefferson Rusk who was a hero of San Jacinto under Houston. Rusk was also instrumental in establishing Nacogdoches University in 1845. The old university building still stands and is maintained by local volunteers. 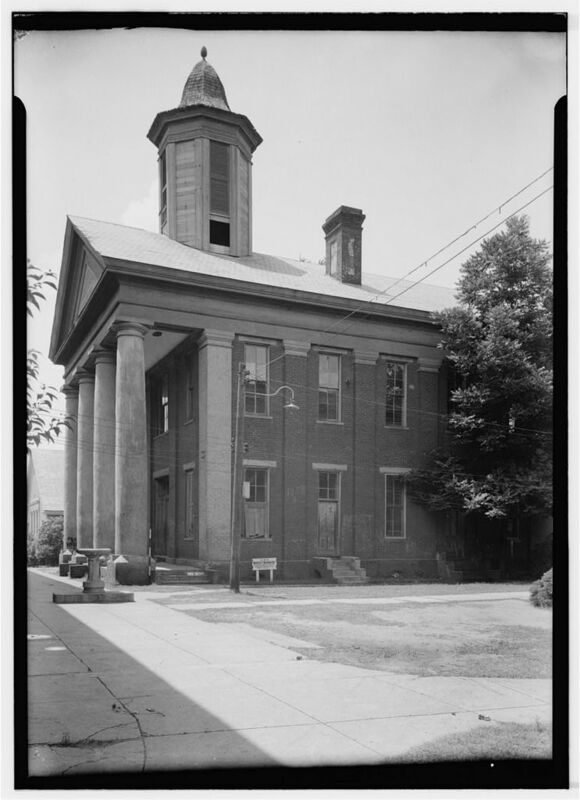 Although local citizens began their campaign for a teacher’s college in the town at the turn of the century, it wasn’t until 1923 that Stephen F. Austin Teacher’s College began with 158 students. The town is one of the most historic in Texas and has proudly preserved its history through the years. Many places in the town are designated historic places and preserved for posterity. If you ever drive down U.S. 59 in East Texas, take time to stop and savor the beauty of the oldest town in Texas. Martha Rogers is a free-lance writer and the author of the Winds Across the Prairie and Seasons of the Heart series as well as the novella, Key to Her Heart in River Walk Christmas and Not on the Menu in Sugar and Grits. The Homeward Journey, her third series is now available. In addition three contemporary romances in Love in the Bayou City of Texas are available on Amazon. 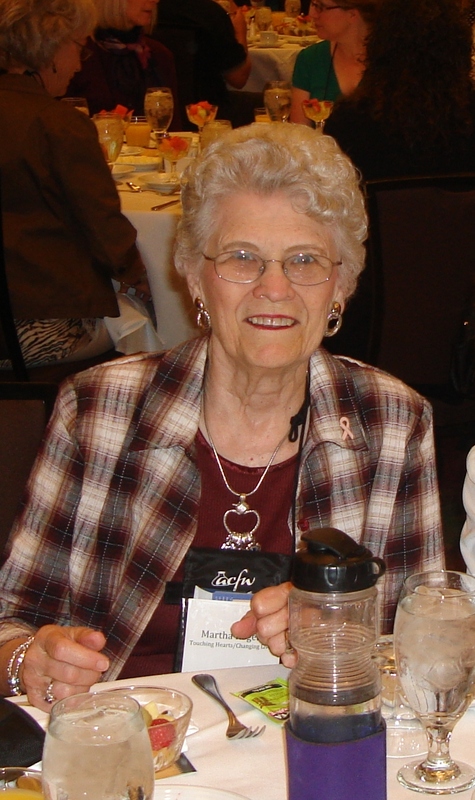 She was named Volunteer of the Year at the ACFW Conference in 2014 and writes the weekly Verse of the Week for the ACFW Loop. In addition to fiction, Martha has contributed to compilations by Wayne Holmes, Debra White-Smith and Karen O’ Connor as well as various devotion books. Martha is a frequent speaker for writing workshops and the Texas Christian Writers Conference. She is a retired teacher and lives in Houston with her husband, Rex. Their favorite pastime is spending time with their eleven grandchildren and three great-grandchildren. Very interesting history! But my question is, how do you pronounce Nacogdoches? I found it on the Texas map, but I never heard of this town before. Thanks, Martha. That is crazy! Some say "nack-o" but I've always heard it as "nack-a". I visited Nacogdoches years ago when my uncle lived there for a time. I wish I was as interested in history back then as I am now, because I totally missed the historical significance of the town. I didn't realize it was one of the first towns in Texas. So, is that Y'barbo we know related to the one you mentioned? You know, I never asked her, but I thought about it as I wrote this piece. I'll let you know what she says. Nacogdoches is such a pretty town, as is all of East Texas, especially in the spring when the dogwoods are in bloom. I am continually intrigued by how rich the history of our State is. Thanks, Martha, for the interesting post. This was so interesting Martha. I really enjoyed it. Seems Texas has a lot of History. I've hardly seen any of it. For only traveled to relatives at vacations once a year. Thanks for this post and GOD bless you. Thank you. I hope you have a chance to visit Texas and soak in some of its history and beauty. From desert like areas and mountains in the far west to the piney woods east and the beaches to the south, Texas has something for everyone. Enjoyed remembering Nacogdoches. Thank you for a fascinating post. And don't forget the beautiful Hill Country and Big Bend. Texas has about anything you'd like.